The name Rajeev Ram first crossed my desk about seven years ago when he won the Columbus Indoors. It soon became a name that I would hear often in the same sentence as winner. 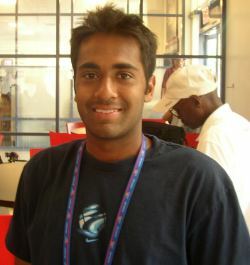 Nineteen year old Rajeev Ram is one of those rare players who has remained consistent throughout his tennis career. Since 1997 he has been in the top 50 nationally (in the top five in 2000-2002) of the USTA National Rankings. His national junior singles titles include the USTA Claycourts, Hardcourts and the Easter Bowl. He has won national doubles finals at those tournaments as well as the National Indoors. He has also collected international titles at the T-Bar-M Championships, the International Grasscourts and two different Chanda Rubin tournaments. The decision of whether or not to go to college was a tough one for Rajeev. He took some time off after high school and had some success on the USTA Professional Circuit. Rajeev struggled with the choice until the very last minute when he decided to go to the University of Illinois this past January. It was certainly a wise choice. Under the direction of Coach Craig Tiley, Rajeev Ram gained experience he couldn't have gotten anywhere -- and NCAA titles for his team and for his doubles event (with partner Brian Wilson). It was a May to remember. I spoke to Rajeev at his third US Open Championships where Coach Tiley and his teammates had appeared at all of his matches for support. Though he had just lost his second round qualifying match, and he was still wrestling with whether or not to return to school*, Rajeev was still one of the most confident players I have spoken to.